Eoin and Sandra send their sincere thanks to all those people who have responded with words of sympathy and kindness. A doctor friend of mine in the UK e-mailed when he heard the simply awful news of Selina, to say “It’s OK to cry. Blokes can cry. Don’t bottle it up. Write it all down…and then don’t read it.” So I’ve poured my thoughts down on paper and I’m NOT reading it…my good friend Michael Clark is. “Take me Back to Tuesday.” Graeme Brady probably doesn’t remember saying that to me but it sets the scene for Selina’s passing. Graeme is one of this world’s true gentlemen. A man of the cloth but doesn’t dwell in or on it. Reminds me of Rob Walker, Stirling Moss’s entrant, being described as ‘a gentleman – in terms of one word as well as two: a gentleman and a gentle man.’ He has been our rock in our time of darkness. Tuesday a week ago and Selina and I were having Eggs Benedict for lunch at Satchmo’s. It took FOREVER to get served but in retrospect I’m probably glad that it did and sorry that I complained about the wait, because it inadvertently gave me more time for what was the last time I’d ever share a meal and a drink with my darling Selina. The next day I heard the news that Selina was dead. The awful finality of it. The day before she was her usual sparkling self and the next day a life was gone. A brilliant, talented career as an artist, snuffed out in a way that probably says more about Selina than anything else she ever did. It’s been the way of artists through the ages. A huge talent, a passion for being herself, a bravery, a supreme courage that would take her beyond her own belief in life. Her life with Alfie was everything. They adored each other. They were best mates. How great it was that they were able to spend all that fun time with each other in the van last month, travelling about the South Island. And how wonderful it had been that Sandra had come out from Surrey to spend time with Selina over Christmas and into January…and how awful for Sandra to have to make such a sad flight back across the world a week later… But how great for Sandra to have spent her last lunchtime in New Zealand last visit with Selina and Alfie having brunch with William and Barbara Lee…forgetting she had shot a roll of film, and having it processed yesterday to discover that it was all about Selina and Alfie at their happy best. Selina’s last book was called “All About Me” but it was really all about Alfie…just that there was another series of books with a little star called Alfie and they had to change the title. Bugger. 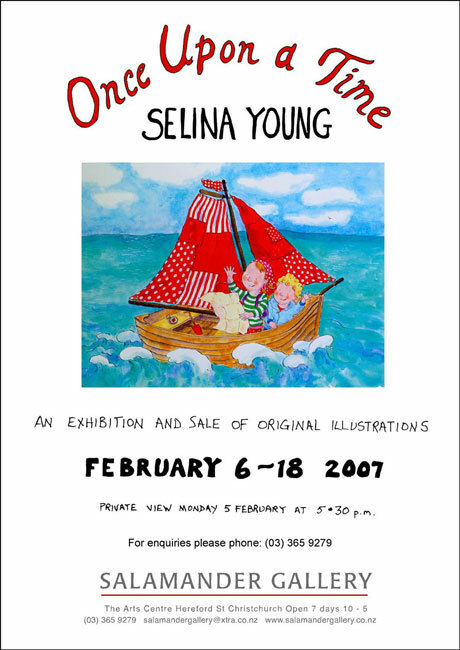 For all her Kiwi ways, Selina was a Surrey girl, and discovered her illustrating talent at Epsom Art College. Soon she was at college in Cambridge and winning the famous Pan-MacMillan national award for the best children’s book, written and illustrated. I remember her phoning me at the South African Grand Prix in tears because she hadn’t received an entry for the competition and her flat mates had. I suggested that maybe it was simply a mistake and to phone for a replacement form. She did and she won the title that brought with it her own art exhibition in Cambridge, then one on London. She had beaten every young artist in Britain. 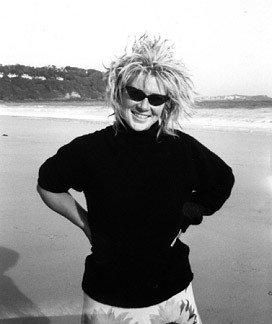 She was a lively little blonde – much like Alfie – and she loved her time each summer in New Zealand when Sandra and I came out for the motor racing series, and in 1993 she moved worlds to make her home in Lyttelton. She worked from home studios around the bay, until she settled with Alfie in Dublin Street. Her rambling home was literally a stone’s throw from the Club where we are celebrating her sparkling life and career and she had entry forms to become a member after her beloved Rat & Roach pub had closed its doors last month. Landlord Brian Prisk was like Alfie’s uncle, looking out for his perky 6-year-old youngest regular. When Alfie heard that the pub was being changed to an Italian restaurant, Selina said Alfie had told her seriously “ I don’t WANT Brian to go…I don’t LIKE Italian food…”Selina’s real uncle – Sandra’s brother, Colin Bourne – sent an e-mail from the UK to say that he would always remember her as his sunshine girl. Selina’s sparkling art earned her a string of book titles with top publishers in Britain and the books sold all over the world. Go to Google, tap in Selina’s name and there are hundreds of pages covering her career. She teamed with Margaret Mahey for a book set in Governor’s Bay and Margaret would say what a delight it was to work with an artist who appreciated the setting and recorded it so well. That book won them both the New Zealand Post award a few years ago. I went up to Wellington for the presentation and I was with Euan Sarginson in the Christchurch departure lounge when he pointed out Margaret checking in. He called her over to the bar and congratulated her on the win. “Don’t congratulate ME,” she said. “All credit is to the artist!” “Bet you’re glad you said that,” said Euan with a laugh. “This is her father!” And for the rest of the day I was Margaret’s chaperon in Wellington for the awards. I think we may have had a drink or two. Our paths haven’t crossed since but I’m just so sorry that Margaret and Selina didn’t get the chance they’d recently discussed, to team up again on more titles. Her family nickname was “Monk” and while I could never remember how that came about, we joked that it was because she looked like a little monkey when she was first born. She would phone and leave a message: “Hi. It’s The Monk. Come over to the Rat & Roach for a sandwich and a drink…” And I knew my day had instantly improved. Looking back, Monk was the only thing I ever made that worked properly and looked good. Sandra I were the world’s proudest parents for nearly 35 years. There have been times in those 35 years when I haven’t always been proud of myself but Selina was the link that kept our family in touch. Selina began life in New Zealand as a new member of the Sarginson household, growing up with Alice and Finny, and regarding Euan and Min as her surrogate Mum and Dad. Today our families share joint grief as we say goodbye to a daughter and best friend. As I write this, memories keep tumbling back over the years. When she bought her first house below the Timeball she announced a “Bottle and Chair Party”…because she only had four chairs and she’d invited 80 people. I remember that dinner party for the Hornby train set she’d arranged on the main table with the little clockwork train delivering shooters to drinkers around the table. And one of her girlfriends sitting beside me, who never realised I was Selina’s Dad until the meal was over. “The Monk” did things in some style. Like the period when she wore her hair in then-trendy dreadlocks…and then chopped them off herself…with tree-trimming secateurs… No wonder the world has been stunned by her passing. She had a way of making each day memorable for everyone she met. Motor racing was the catalyst in our lives and Selina saw heaps of it, and met lots of international racing names when she was Alfie’s age. Sandra worked for John Surtees when I was working for Bruce McLaren when we met. Selina’s godparents were Patty McLaren and Denis Hulme. I remember the days at early GPs when we would be high up in a European press box as the cars came clamouring to the grid, and she would be prattling away, drawing in her notebook….and as soon as the cars had stormed away from the start she was fast asleep…waking when the race was over! I have to confess to being mostly an absent Dad – away at GPs in Europe and CanAm races in North America while Sandra did the mothering and the grooming of an amazing young lady, who crafted herself into a creative artistic talent of world class, as Margaret Mahey will confirm. We were at Goodwood one day watching the planes taking off on the airfield and I realised we were standing beside “Mr Bean”. I knew Rowan and introduced Selina to him. Her eyes were like saucers. “Hello Selina -- my name’s Rowan Atkinson.” We laughed about it afterwards because we reckoned EVERYONE in the world knew who he was…just that they hadn’t been lucky enough to have been introduced. Then there was the time when she was about 16, Selina and I flew to Cortina in Italy for the end of a big international classic rally and we were waiting for the restaurant doors to open for the official presentation when we saw Stirling and Susie Moss in the crowd. Next minute Stirling is beside Selina and I’ve introduced them. He made out that he was amazed. “Your DAUGHTER. Good God, I thought she was your girlfriend…” and he whisked us away to join them at their table, taking Selina straight to the head of the queue when dinner was announced. Life was like that then. Now life without Selina will never be the same again. “Hi. My name is Emily and Selina has been a friend of mine for about thirteen years. I still remember the day I met her. She was unforgettable. A cross between a pollyana and a poppy long stockings, fresh as a daisy but yet undeniably a beautiful young woman. She was wearing a colourful striped jersey, a petticoat skirt, rainbow coloured knee high socks and Dr Marten boots. I was enchanted. She was enchanting. The cutest English accent and a smile so big it took over her whole face. I liked her straight away. We all did. It was so obvious she was special. Creativity oozed from her. She was entertaining and delightful. Warm and funny. Selina was addictive. We all wanted a fix. I loved being with her, they were some of the funniest times. In her house, at the many parties, anywhere she was, they were all very good times. We were all growing up together and having so much fun doing it. Selina had a risqué sense of humour and was a fantastic story teller. She was so emotive and open. I loved the way she gesticulated when she spoke and the way she twisted her dreadlocks between her fingers when was in thoughtful mode. I adored her quirkiness. I giggled with delight when she told me how as a young child beginning school, a bed was set up for her at the back of the class room and each day she would hop in and have a sleep. When I first met Selina I was in my very early twenties and Selina was still hopping into bed every day for what she called a ‘power nap’. I was so proud of Selina and her accomplishments. She was incredibly modest and I know I embarrassed her no end as I was always showing her off. But she was an exceptionally gifted and highly intelligent person and too modest about her life’s accomplishments. I feel very privileged to have had Selina in my life. She truly was a wonderfully kind and loving friend. Thank you, Sandra and Eoin, for having such a wonderful daughter. I shared with her many of life’s highs and lows. Selina was a sensitive soul and was deeply saddened by her relationship troubles. She loved Tony deeply and she so wanted to create her own happy family – mother, father and child – and was of course devastated that it was not meant to be. Selina had so much love for everyone and in return loved to be loved. And she was. I truly believe she knew that.She adored both her parents and missed you terribly Sandra, worried constantly about you being so far away and on your own and was always so happy when you visited. I thought Selina the most amazing mother and I know it was because she had a wonderful role model. All my love and deepest sympathy. Emily Meates. Thursday, 16th February, 2006. I first met Selina in 1992. I was instantly drawn in by this sunny, gregarious, mischievous, eloquent, bundle of fun, she regularly came to Northamptonshire to visit and in turn I too came to the house in East Horsely on a few occasions. I remember her fabulously blue bedroom and her stash of chocolate wrapped in a carrier bag, and the lovely leaded window where she would be perched. We would pile into her little black Austin A30/35 ( I hope I've got that right?) even Blue the Spaniel would come along for the ride. She had no fear and would drive right into London and park smack bang in the centre of Chelsea, I remember thinking how impossibly glamorous she was teetering down the King's Road in her high heels with a tiny handbag and with Blue on a matching gingham lead. I had never met anyone quite like her before and haven't since. In retrospect I think I was ever so slightly in awe of her, being in my early twenties it seemed like such an uncool thing to admit, but I don't mind admitting it now. Such as when Selina decided, shortly after the passing away of her grandmother, that we would move into her house as it would be cool to live as a group of friends, imagining all of the super sophisticated parties that we would throw and all of the men that would throw themselves at us, but she overlooked one small detail, the STENA STAIRLIFT!! Ever resourceful, Selina suggested that we cover it with a throw, something embroidered and stylish that she would put together! - "nobody would notice!" she exclaimed. How we chuckled at the thought that anyone could ignore the fact that there was a stairlift? We continued to laugh, again and again...............................as we all rode up and down the stairs for the remainder of the afternoon. beauty spot with the curtains drawn, candles flickering and a bottle of Kahlua and milk to finish off laughing and laughing until our sides hurt. During my visit to NZ, I remember Selina used to tear around the roads in and around Christchurch in her cream Morris Minor blasting out her favourite album of the time which was the Best of the Guess Who Band. To this day I still can't listen to them without thinking of her. It seems like such a long time ago, but full of so many funny, happy, memories. At some dinner parties I still use her little place setting trick of boys names on bananas and girls names on pears. I haven't seen or spoken to Selina since a visit to Lyttelton in 1994. When I left New Zealand I felt that Selina had found her place, she really seemed to belong. I am now a married mother of two and just happened to go online, to try and find a correspondence address for Selina through her publisher so that I could write to her and tell her how much enjoyment I was getting from reading her books to my young son and daughter. The previous day I had hung a picture that she had drawn of my beloved ginger moggy in the children's bathroom of our new house, but rather than finding an address I was shocked and saddened by the news of her passing. Reading your tribute on your website bought tears to my eyes, you captured the beauty of Selina perfectly. Alfie looks like a gorgeous little boy, with the very same twinkle in his eye, he had a special Mummy indeed. I feel privileged to have known her if only for a short time. I really do believe that people like Selina were put on this earth for a reason to a have an influence and lasting effect on the lives of others, on me she certainly did. Dionne Prince. 24th April 2006. I have just discovered the terrible news about Selina. I am devastated and deeply shocked and I cannot image the pain that both you, Sandra and Alfie must be going through. I had been trying to contact Selina since her last visit to England, but she had never returned my emails. I knew that before she returned back to new Zealand she was full of expectation to reconcile with Tony, and was devastated when it did not happen. Having not heard anything back from her, I thought with a new year this year I would make it my mission to contact her, and last night, after no answer on any of the phone numbers I had for her, I decided to do a web search on her name. To my shock and horror the first thing I discovered was an obituary. Since then I have been trying to contact Sandra to find out what happened and to express my sympathies, when I came across your website. I too have so many wonderful memories of her, having been at Barbara's together with our ponies when we were 11, then going to shows and to pony club camp.And then of course St . Teresa's School. Over 20 years we were friends, I can remember coming to stay with her when you lived in Green Dene. Now every Wednesday I drive past that house to deliver flowers to Horsley, and I always think of her, now I am sure I will just cry but with my own grief of losing such a long standing friend. She always used to look me up when she came over. Last time we saw each other practically every day during the 5 or so weeks she was over. Even though we didn't see each other for a couple of years at a time, when we were back together it was just like old days, it is bizarre that the relationships you have with certain people are like that, a true friendship. Being able to talk about anything and sometimes just being comfy not having to talk. My fondest memories of her are when we used to ride up Polesden Lacey singing Madonna songs very loudly when we were at Barbara's - we used to add a few of our own words to them too, ,making up songs as we were riding ( we were probably 11 or 12 yrs old at the time ). I can never listen to a Madonna song without thinking of Selina and our own take on that particular song !.. Then all the fun ( and mischief) we had at the pony club camps !.. Then during our school years, our first pubs and boyfriends. I can remember when she turned up at the nursery one day on her first return back from NZ, I hadn't seen her for a couple of years.Although we had been in contact via the old fashioned air mail ! We had such fun catching up. It was so good to see her again as we went back such a long way. The next time I saw her , she again turned up at the nursery , again after another couple of years, with a baby Alfie in her arms !. . I couldn't believe it .. I had a son a month after Alfie was born, so when again when she came over they all played ( I had a daughter before my son, so the 3 of them used to play in Sandra's paddling pool ). I have notified our St Teresa's friends, who in turn are heartbroken and distraught at the terrible loss of such a wonderful person. They too send their condolences to both you, Sandra and Alfie. I think we will probably organise a school reunion ( or something) in her memory for her between us. And have our own drink in memory of our old school friend. We all have our own special memories of her. I do hope Alfie is keeping well , and is coping alright. They were indeed so close, and Selina adored him, as indeed she adored you and Sandra. 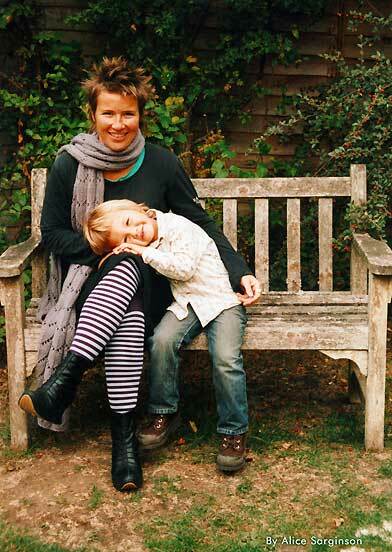 My thoughts and heart go out to you, Sandra and gorgeous little Alfie. I know that it is some time now that Selina has passed away, but I only discovered this today. I was very shocked and wanted to write to you to offer my deepest sympathy. I was at St Teresa's with Selina. She was always a very close friend as we went through Grove House and St Teresa's together. I always remembered her even though we lost touch after we left school and went our separate ways. I was delighted to come across her books one day in a local book shop (we now live in Spain, having moved away from Bookham some years ago). I was so proud to read her books to my 3 children and I was proud to tell them that the author had been my dear friend from school. I always remember Selina's talent for drawing and making up cartoon like stories. She was known for her drawing at St Teresa's, a real artist and from such a young age. I wasn't then surprised to discover she had made a career out of it, and a successful one at that. I knew that she had moved away to New Zealand and that she had had a child, I had wanted to make contact with her again, but that wasn't to be. I have wonderful memories of coming to your house in Green Dene. We often went across (from what I remember) from your house to an area of field where we built camps. I always remember Selina was a lot braver than I was. She didn't mind turning over logs and touching spiders and other nasty things that were hiding under there. That was her job, I just kept the camp tidy. I wasn't aware (or I had forgotten) that she was brought up in a life of motor racing. With that we had something in common, I ended up marrying an ex formula 1 driver, called Bertrand Gachot. Even though he did not know Selina, he knew you Eoin and he sends you his condolences. I am so sad to learn that this is the end of a very young life. I shall cherish the memories that I have of Selina and will take extra great care of the little book collection that we have built up of her books. 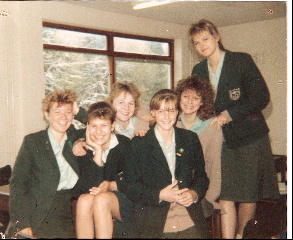 I thought that you may like to see this photo I have of Selina with some other friends from school. This was taken in our last year of school, the 5th year. We must have been 16. I am sorry that the quality isn't very good, but it is the only picture that I have of Selina. EXHIBITION and SALE OF ORIGINAL ILLUSTRATIONS. See the poster above. Proceeds from the sale go to a trust fund for Alfie.